It shouldn't, not if we can help it, and if it does, tell us and we will do everything we can to reduce your discomfort. Our dentists apply a numb gel to the gum for a few minutes which can eliminate or really reduce the sting of a dental needle. We aim to provide as comfortable and painless treatment as possible, and we go to extra lengths to ensure this is the case. I've not been to the dentist for a long time. I'm not sure what to do? Making an appointment to discuss with our dentists what problems you have is the hardest step. As dentists we have always had a deep respect for people when they make that first step. We will treat you and your dental issues with respect, nothing will shock us. Once you come and see us you will see that there are things we can do to help. Things have changed significantly in dentistry over the last 10 -20 years, and all our dentists are kind, gentle and experienced. We often advise that the first visit is best when it is an examination, possibly xrays and a good chat about how things are, how we can help and how we can do the treatment comfortably. I'm not in a health fund, how much will it cost? Call our friendly receptionist to discuss what costs there are for specific things that you want or may need. In general, it is not expensive to come in for an initial exam, and it is an investment on your health. With advice and guidance from our dentists, you can get information on which treatments might be needed and information regarding expected costs. All of the dentists at Banora Seaview Dental will happily give written quotes for procedures. We strive to provide high quality dentistry at reasonable cost. We want you and your family to able to access dental care and we believe this should be accessible to all. There are some schemes and programs available which can help those who need it most, access the dental care they need. Being a part of HCF's 'more for teeth' program, accepting public dental vouchers, bulk billing the Child Dental Benefits Schedule and DVA are just some of the ways that the team of BSD are helping take the sting out of dental care. > BULK BILL DVA and welcome new DVA patients. > BULK BILL Child Dental Benefits Schedule, see our home page for details. > Accept Public Dental Vouchers. > Dr Stuart will offer a 10% discount to pension card and concession card holders, please notify reception if this applies to you. > Dr Stuart is a member of HCF's more for teeth program, which allows 2 no-gap check-up and clean and polish, fluoride treatment and any x-rays and a sports mouthguard a year! see home page for details or contact reception or HCF. Special offers will appear on our website. We now are open late nights, early mornings and saturdays to help make coming to see us easier. Root canal or endodontic treatment is a process whereby inflamed or dead pulp is removed from the inside of the tooth, enabling a tooth that was causing pain to be retained. Dental pulp is the soft tissue in the canal that runs through the centre of a tooth. Once a tooth is fully formed it can function normally without its pulp and be kept indefinitely. After removing the pulp, the root canals are cleaned, sterilised and shaped to a form that can be completely sealed with a filling material to prevent further infection. The treatment can take several appointments, depending on how complex the tooth is, and how long the infection takes to clear. Subsequently a crown or complex restoration to restore or protect the tooth may be a necessary recommendation, as a tooth after undergoing treatment may be more likely to fracture than a perfectly healthy tooth. 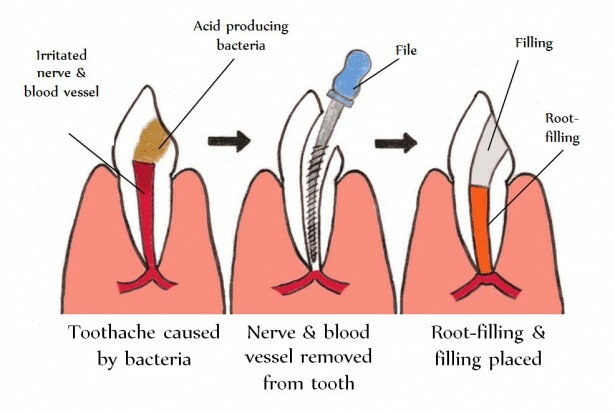 The diagram below depicts root canal treatment. If no treatment occurs, the infection in the nerve or pulp of the tooth causes an abscess and the infection starts to spread. Root canal is a treatment that often causes fear and anxiety in patients. The dentists at Banora Seaview are very experienced in root canal and will be able to perform the treatment comfortably, please talk to us about your concerns and in the vast majority of cases our patients report that it was nothing to worry about! I have trouble with my wisdom teeth, what should I do? This link provides an excellent overview of wisdom teeth and their potential problems. The dentists at Banora Seaview Dental will carefully assess and manage your particular wisdom tooth problem, though sometimes a referral to an oral surgeon is required. What is Gum disease? How do i know if i might have it?? Gum disease, or periodontitis, is an inflammatory disease that affects the structures supporting the teeth eg gum and bone. It is a chronic, progressive condition that causes the loss or shrinkage of gum and bone. Gum disease is caused by microrganisms that adhere to the tooth on plaque ( sometimes called tartar or calculus ) and by our immune response to these microrganisms. People with gum disease may noticed redness of gums, bleeding, gum shrinkage, bad taste or halitosis and in severe cases loose teeth. There are many types of gum disease, and it is very important that if you think you might be suffering from gum problems that you should make an appointment to get a check-up. Our dentists will carefull assess your whole mouth, gums, the pockets where the teeth meet the gums and your teeth. Studies have shown a link between untreated gum disease ( which is a chronic infection of your gums and the bone underneath ) and heart disease - myocardial infarction, athersclerosis and stroke. Untreated gum disease causes increases in inflammation in the body, and it is from these inflammatory processes that gum disease can affect your general health. Some recent studies have even linked gum disease and erectile dysfunction ! - though no causative link has been made. Please contact reception for an appointment to see one of our friendly dentists if you think you may have gum disease. It is a condition that cannot be cured or reversed, but can be managed and therefore your risks of losing teeth and risks on your general health is much reduced. Bruxism is a dental term used to describe the abnormal function of teeth ( and the muscles involved ), usually an excessive bite force on the teeth either while asleep or awake. Bruxism is a common problem with an estimated prevalence range of 8 - 31%, often with little or no symptoms, which can lead to damage to teeth, loss of teeth, tense sore muscle and headaches, neck-aches, and stress on the joint that joints the lower jaw to the skull ( Temperomandibular Joint - TMJ ). Like many slowly progressive conditions, it is often not noticed until damage has occurred. Symptoms are mild for a long time, any muscle tension at the angle of the jaw or the temple area can feel normal, because the tense muscle has been like that for a long time. The muscles that control closing of the jaw and therefore grinding/ clenching of the teeth become more developed, stronger and constantly reinforce the feedback loop that continues and potentiates the habit. Some people believe that Bruxism could be driven by the muscle memory of these muscles and a feedback loop that means the more you do it, the more deeply ingrained the habit/ memory, and thus management of the habit using relaxation of these muscles, massage, stretching and awareness of jaw habits will not have success when used alone. The treatment of Bruxism has changes slowly with time. It has historically been an area of regular disagreement among dentists and specialists that treat this condition. It is a widely varied condition which can mean that treatment needs to be specific to the patent, for example, clenching of teeth is quite different to grinding of teeth, also other people clench and slide the teeth in certain directions, these all produce different symptoms, tooth wear/damage, and muscle symptoms. Botox is an exciting developement as it may be best way to stop or significantly reduce the habit at source. It can actually stop the whole habit rather than managing the forces involved by just protecting teeth with a splint. Botox reduces the ability of the muscle to contract, it does this by blocking a neurotransmitter that tells the muscle to contract. this causes atrophy (shrinking) of the muscle and a cessation in the muscle memory. The effects of Botox last for six months, in that time the muscle can be deprogrammed from its previous harmful patterns and even if the habit resurfaces, the muscle is much smaller and weaker. Splints can also be very useful, especially in those people with minimal symptoms or awareness of their habit, and in those with no muscle symptoms. These are usually a special dental acrylic that covers the upper teeth and generally worn at night. People who have more of their symptoms towards the end of the day may not benefit from a night time splint as their habit may be occuring during waking hours. If you think that you may be clenching or grinding your teeth it is important to get this assessed, prevention is always better than cure, and in the case of bruxism, you only have your teeth to save, and potentially less headaches, neck-aches and less emergency dental appointments!